The NASA Innovative Advanced Concepts (NIAC) program recently awarded 25 grants for the development of visionary new technologies. Here we’re going to take a closer look at three Phase I awards focused on planetary exploration. The LEAVES (Lofted Environmental and Atmospheric VEnus Sensors) concept is an ultra-lightweight, passively-lofted, and inexpensive atmospheric sensor package that is designed to withstand the harsh Venus atmosphere, but which also provides a generic platform for in situ sampling of any planetary body with a prominent atmosphere. This architecture is intended to provide high spatial and temporal resolution during atmospheric sampling by operating in parallel, rather than a more traditional serial approach By removing the need for active propulsion or guidance (as with aircraft) or inflation media and buoyancy control (as with balloons), the LEAVES units require very little infrastructure. Mission science objectives are achieved through the deployment of many identical units over a wide geographic area, cost savings are realized through reusable production lines and commercially-available components, and operational resilience is increased through parallel operations. Moreover, this architecture is exceptionally well suited as a secondary payload as it requires few control resources from ground stations, poses very little risk to a primary payload, and returns data only for the duration of their slow descent through the atmosphere. 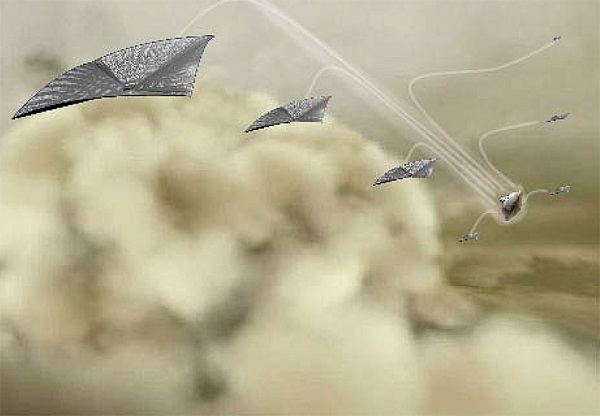 The objective of the proposed work is to increase the set of possible exploration and science missions on Mars by investigating thefeasibility of flapping wing aerospace architectures in a Martian environment. The proposed architecture consists of a Mars rover that serves as a mobile base and a swarm of Marsbees. Marsbees are robotic flapping wing flyers of a bumblebee size with cicada sized wings. The Marsbees are integrated with sensors and wireless communication devices. The mobile base can act as a recharging station and main communication center. The swarm of Marsbee can significantly enhance the Mars exploration mission with the following benefits: i) Facilitating reconfigurable sensor networks; ii) Creation of resilient systems; iii) Sample or data collection using single or collaborative Marsbees. Key technical innovation includes the use of insect-like compliant wings to enhance aerodynamics and a low power design. 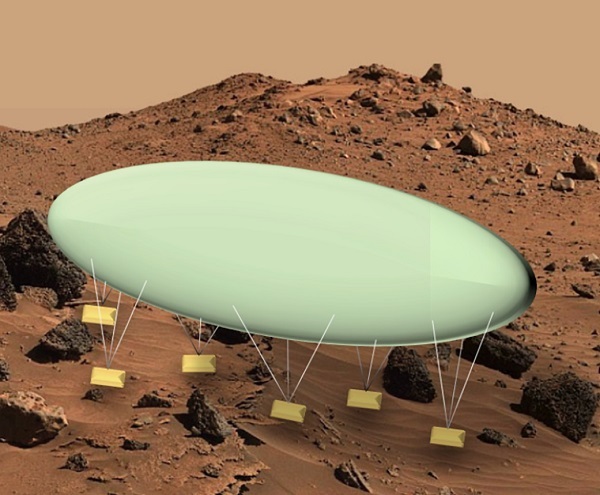 High lift coefficients will be achieved by properly achieving dynamic similarity between the bioinspired insect flight regime and the Mars environment. Our preliminary numerical results suggest that a bumblebee with a cicada wing can generate sufficient lift to hover in the Martian atmosphere. Moreover, the power required by the Marsbee will be substantially reduced by utilizing compliant wing structures and an innovative energy harvesting mechanism. Because of the ultra-low Martian density, the power is dominated by the inertial power. A torsional spring mounted at the wing root to temporarily store otherwise wasted energy and reduce the overall inertial power at resonance. Whereas rotary wing concepts are much more mature in both design and control, these two innovations are uniquely suited to bioinspired flapping vehicles and provide flying near the Martian terrain as a viable means of mobility. The proposed work combines expertise and talent from the US and Japan in a multidisciplinary program to address fundamental aspects of flapping wing flight in Martian atmosphere. The University of Alabama in Huntsville team will numerically model, analyze, and optimize a flapping flyer for Martian atmospheric conditions. The Japanese team will develop and test a micro flapping robot, uniquely designed and constructed for the low-density atmosphere on Mars. The hummingbird Micro-Air Vehicle (MAV), developed by the Japanese team is one of only a few robotic flappers in the world that can fly on Earth. The objective of Phase I is to determine the wing design, motion, and weight that can hover with optimal power in the Mars atmospheric condition using a high-fidelity numerical model and to assess the hummingbird MAV in the Mars conditions. The aerodynamic performance of the hummingbird MAV will be assessed in a vacuum chamber with the air density reduced to the Mars density. Systems engineering optimization will be performed as well for the entire mission. The maneuverability, wind gust rejection, take-off/landing, power implications, remote sensing, and mission optimization will be addressed in Phase II. We propose a balloon platform with 6 suspended modules each containing a payload that also serves as a foot for locomotion. Each foot is suspended by 3 cables to the balloon to control the placement of the foot on the ground. Only 1 foot/payload is raised at a time to move to a new location on the surface while the remaining feet keep the balloon anchored to the surface. The balloon buoyancy is only needed to lift 1 foot at a time. Feet are moved in sequence to locomote over the surface. The platform is highly stable because its center of gravity is almost at ground level. Images from cameras on the balloon are used to map and locate foot placement and for navigation. If you want to call your concept “Leaves” just call it Leaves.